Good morning, my dears! I am so happy to be feeling close to full steam again after getting hit with the flu (me and almost everyone else in the country, it seems). It's so crazy to me how you can go from feeling top notch one minute to curled up in bed, tossing and turning, and bouncing between being too hot and shivering with cold in matter of half an hour. But lots of rest (and tons of fluids later), I am most definitely on the mend. My energy still has some room to grow (doing errands yesterday almost wiped me out! ), but it could certainly be worse. But on to more exciting things! Today is a Thrifted Kitchen day (woo-hoo! ), and since Valentine's Day is already on everyone's radar, I thought I'd start working on some sweet recipes for you to make for loved ones. My first stop is the Hershey's 1934 Cookbook (hey...they know chocolate!) 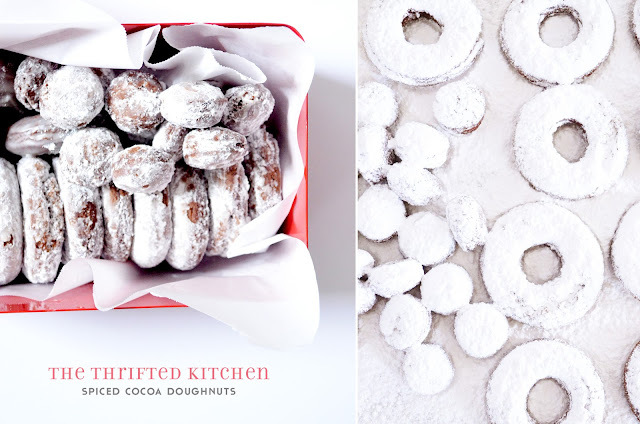 and its spiced cocoa doughnuts recipe. 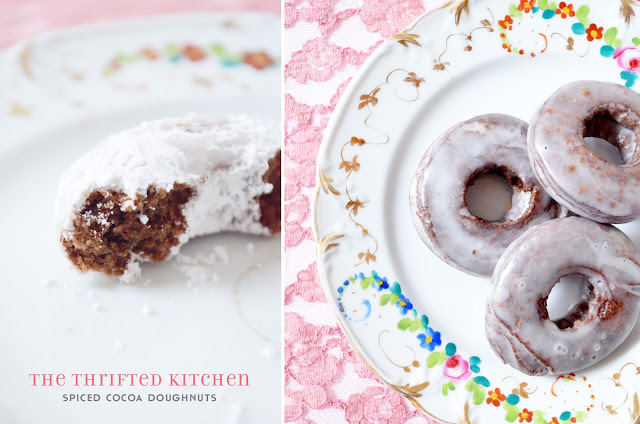 This one caught my eye because it's a cake doughnut instead of yeast-based, which means that once the dough is made, you're ready to start frying. No rising, no proofing. One thing you'll want to make sure you have (unless you have an innate ability to tell how hot oil is) is a candy thermometer, because the temperature of the oil is key for frying doughnuts. And while I did coat some in powdered sugar, per the recipe, we also coated some in this vanilla glaze, which I would recommend, because those doughnuts stayed soft and fresh much longer (and I think it tasted better, too...the glaze helped break up the cakey-ness of the doughnut). Sift together the flour, cocoa, baking powder, baking soda, salt and spices. Cream butter and sugar and beat in egg well. Add dry ingredients alternately with milk and mix well. Turn out on floured board and roll 1/4 inch thick; cut into small dainty rings (2 1/2 inches in diameter). Fry in deep fat (370 degrees) for about 30 seconds. 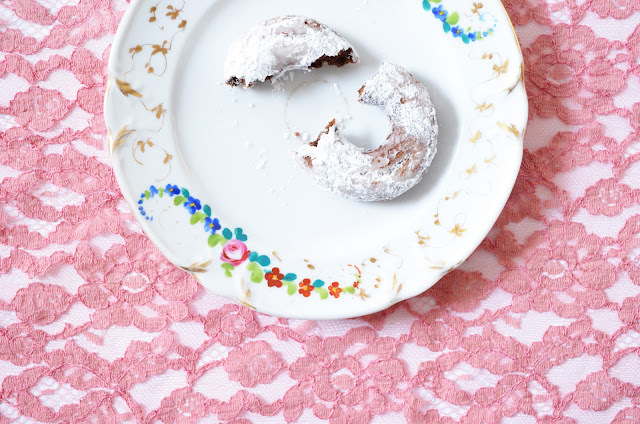 Drain on paper; sprinkle lightly when cool with confectioners' sugar mixed with a little cinnamon.